Sara Patricia Pascoe (born 22 May 1981) is an English comedian and actress. She has appeared on TV programmes such as 8 Out of 10 Cats Does Countdown for Channel 4, and Taskmaster for digital channel Dave. Pascoe was born to Gail Pascoe (née Newmarch) and Derek Pascoe, a musician. A maternal ancestor was the music writer Rosa Newmarch. Born in Dagenham, East London, Pascoe was later raised in Romford, where she attended Eastbury Comprehensive School. She later attended Gaynes School in Upminster. Pascoe read English at the University of Sussex, where she befriended Cariad Lloyd. After graduation she worked as an actress, and supplemented her income with temporary work. Pascoe has appeared in many television programmes and panel shows, including Stand Up for the Week, The Thick of It, Mock the Week, The Increasingly Poor Decisions of Todd Margaret, Campus, Being Human, Twenty Twelve, QI, Have I Got News For You, and W1A as well as all-female sketch show Girl Friday (part of Channel 4's Comedy Showcase), which she co-wrote. Pascoe began performing stand up comedy in 2007. In August 2010, she performed her first show at the Edinburgh Festival, Sara Pascoe Vs Her Ego. The show received positive reviews. On 19 February 2012, she appeared on Episode 11 of the Comedian's Comedian Podcast hosted by Stuart Goldsmith. In 2012, she appeared on Live at the Apollo. She appeared on BBC TV panel show QI in 2013 and won the episode with +28 points. In 2014, she performed at the Edinburgh Festival and toured the UK for the first time with the show Sara Pascoe Vs History. The show was nominated for the Foster's Edinburgh Comedy Award 2014 for Best Comedy Show. In October 2014 she appeared in Never Mind the Buzzcocks and stood in line at the identity parade round as a former dancer and back-up singer for entertainer (and Robbie Williams's father) Pete Conway. Also that month, she appeared on the topical panel quiz Have I Got News for You as a panellist and in one of the sketches of the Channel 4 charity night Stand Up to Cancer. In 2015, she appeared as a panellist on two Radio 4 programmes, science discussion programme The Infinite Monkey Cage in February, and comedy quiz programme The Unbelievable Truth in September. In 2016, along with numerous other celebrities, Pascoe toured the UK to support Jeremy Corbyn's bid to become Prime Minister. She has appeared in all three of Frankie Boyle's Autopsy BBC programmes (2014–2016), discussing political issues. In 2017 she starred in his Frankie Boyle's New World Order topical series. In 2017 she also performed a half-hour stand-up set on episode 1 of series 2 of Live from the BBC. On 27 October 2017, she appeared in an episode of British travel documentary series Travel Man on Channel 4. In February 2018, she started a BBC Radio 4 series called Modern Monkey. In April 2018, she appeared as a panellist in two episodes of the BBC Radio 4 panel show Just A Minute, coming fourth in both episodes. In May 2018 she starred in a BBC comedy short entitled "Sara Pascoe vs Monogamy". Pascoe is a vegan. She lives in London. From 2013 to late 2016, Pascoe dated comedian John Robins, and her reflections on that relationship and its aftermath were the basis of her 2017 show LadsLadsLads at the Edinburgh Festival Fringe. ^ a b c d Bruce Dessau (4 July 2014). "Interview: Sara Pascoe on female instincts, healthy sperm and her latest show". London Evening Standard. ^ a b Sara Pascoe (19 April 2016). Animal: The Autobiography of a Female Body. Faber & Faber. p. 19. ISBN 978-0-571-32523-8. ^ Richard Herring (12 November 2014). "Richard Herring's Leicester Square Theatre Podcast - with Sara Pascoe" – via YouTube. ^ Elisa Bray (14 August 2014). "My student days: Six musicians, actors and comedians fondly reminisce". The Independent. 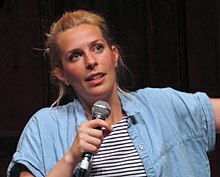 ^ a b c "East Londoner Sara Pascoe says teenage house party ended in disaster but led to fame". East London and West Essex Guardian Series. ^ "Girl Friday – C4 Sketch Show – British Comedy Guide". Comedy.co.uk. Retrieved 16 December 2011. ^ Brian Logan (7 August 2013). "Sara Pascoe: And now for Nietzsche ... | Stage". The Guardian. Retrieved 14 September 2013. ^ Julian Hall (10 August 2010). "Sara Pascoe vs Her Ego, Pleasance Courtyard – Reviews, Comedy". The Independent. Retrieved 16 December 2011. ^ Duska Radosavljevic (10 August 2010). "Sara Pascoe vs Her Ego – The Stage / Edinburgh 2011". The Stage. Retrieved 16 December 2011. ^ Guide, British Comedy. "Episode 11 – Sara Pascoe (Live) – The Comedian's Comedian Podcast with Stuart Goldsmith – British Comedy Guide". British Comedy Guide. Retrieved 5 November 2016. ^ "Sara Pascoe Live at the Apollo". YouTube. 2 December 2012. Retrieved 20 February 2015. ^ "BBC Two – QI, Series K, Knees & Knockers". BBC. 21 February 2014. Retrieved 23 April 2014. ^ "News: Sara Pascoe Announces First UK Tour". Beyond the Joke. 29 May 2014. ^ Brian Logan (23 August 2014). "John Kearns wins the Foster's Edinburgh comedy award 2014". The Guardian. ^ a b Stephanie Merritt (19 October 2014). "Sara Pascoe: 'Female sexuality is an active thing'". The Guardian. ^ "BBC Radio 4 – The Unbelievable Truth, Series 15, Episode 3". 23 September 2015. ^ "#JC4PM". jc4pmtour. 28 July 2015. Retrieved 15 July 2017. ^ Wilkinson, Michael (1 February 2016). "Celebrities to tour Britain in 'Jeremy Corbyn For Prime Minister' musical show". The Daily Telegraph. Retrieved 15 July 2017. ^ Joshua Farrington (2 March 2015). "Pascoe tackles the female body for Faber". The Bookseller. ^ "Animal". Public Store View. Retrieved 19 May 2018. ^ "Taskmaster Series 3 line-up revealed". British Comedy Guide. 16 April 2016. ^ "BBC – Sara Pascoe, Tim Key, Nick Helm and Spencer Jones make new BBC Comedy Shorts – Media Centre". www.bbc.co.uk. Retrieved 31 July 2018. ^ Brian Logan (5 August 2017). "Sara Pascoe: LadsLadsLads review – breakup tales from a woman reborn". The Guardian.